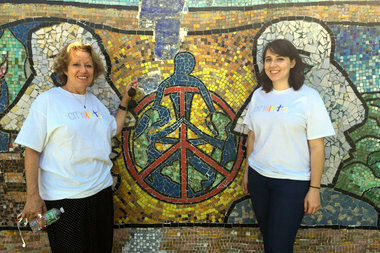 CITYarts executive director Tsipi Ben-Haim, left, in front of a "Peace Wall" mosaic on West 138th Street in Hamilton Heights. CHELSEA — A proposal to create murals in two Chelsea parks has been criticized by residents who feel the neighborhood has not been included in the planning process. At a Community Board 4 committee meeting on Thursday evening, the founder of CITYarts, an arts and education nonprofit, presented a plan to recruit Chelsea youths to craft painted or mosaic murals at the Gertrude Kelly Park at West 17th Street and Eighth Avenue and Clement Clarke Moore Park at West 22nd Street and Tenth Avenue. “We bring the community together and focus mainly on the youth, so they don’t spend their time outside on the street, but actually engage in a special, positive, creative project,” CITYarts executive director Tsipi Ben-Haim said during her presentation. But some meeting attendees and Waterfront, Parks and Environment committee members expressed dismay that CITYArts’ project had begun moving forward with plans without consulting neighbors and local block associations first. Others took issue with the way the organization described the parks it had flagged as potential mural sites. “Clement Park feels abandoned?” 400 West 21/22/23rd Street Block Association member Jean Blair asked. “That’s just amazing — that’s the most un-abandoned park I’ve ever seen,” block association president Mary Swartz added. Committee members also raised concerns that CITYArts would not be able to maintain the murals in the years after their creation were they to fade or fall victim to graffiti artists. “[What will happen] 20 years later, when I’m looking at some mess on the wall that’s faded?” member J.D. Noland asked, adding that he felt public parks were not ideal locations for murals. The committee chose not to make a decision on CITYArts’ proposed project until the organization had met with block associations based near the two park sites. “Those are the people who want to be most involved, and they’re the ones who are going to be opposed, and we don’t want to override that,” committee member Brett Firfer explained. CITYArts, which has led youth art workshops at the Chelsea Recreation Center in the past, has been involved with nearly 300 mural projects since Ben-Haim refounded the organization after the original one closed in 1989, according to its website, including the restoration of a "Peace Wall" in Hamilton Heights and a floral-themed mural on the Upper West Side.